Belinal® gluco blocks the breakdown of carbohydrates and, consequently, reduces the rise of blood glucose levels. Furthermore, it also contributes to the proper functioning of insulin in the body. If our body lacks chromium, more insulin is required for appropriate control of blood glucose levels. Insulin is a hormone acting as a "key", which opens the cells and enables glucose entry which is then converted into energy. In addition, chromium helps to reduce the level of harmful cholesterol and increase the level of beneficial cholesterol in blood, which reduces the risk for cardiovascular diseases. Due to the potent antioxidant activity Belinal® also protects cells from the damage caused by free-radicals, which are more rapidly produced in case of high blood sugar. • individuals with poor diet, especially those with predisposition to obesity. Belinal® a unique extract from the branches of Slovenian silver fir, is completely natural mixture of oligo- and polyphenols, which has been scientifically investigated and analyzed at the Faculty of Pharmacy, University of Ljubljana. Branches of highest quality are manually collected from ecologically intact forests of Kočevje region. There is no extra tree felling required for production of Belinal® extract since the amount of raw material from the regular annual harvest is already sufficient. Optimized process of industrial extraction involves only the use of pure water and excludes the use of alcohol or harmful organic solvents. Scientists discovered more diverse composition of polyphenols in branches compared to the bark. 36 different polyphenols, all acting synergistically, have been identified so far. In particular, the mixture contains higher amount of low-molecular polyphenols which have many beneficial effects on the body. Predominant species of the extract are phenolic acids, lignans and flavonoids, all acting as potent antioxidants, and in addition to this, individual groups of substances in Belinal® also have anti-inflammatory activity and inhibit digestive enzymes. Belinal® gluco also contains chromium, which has a role in the metabolism of macro-nutrients and contributing to the maintenance of normal glucose levels in the blood. Lowering blood sugar levels is an important part of the health of every human being, because high blood sugar can trigger inflammatory processes in the body and cause damage to body tissues. In fact, permanently elevated blood glucose concentration is the main cause of many degenerative diseases. 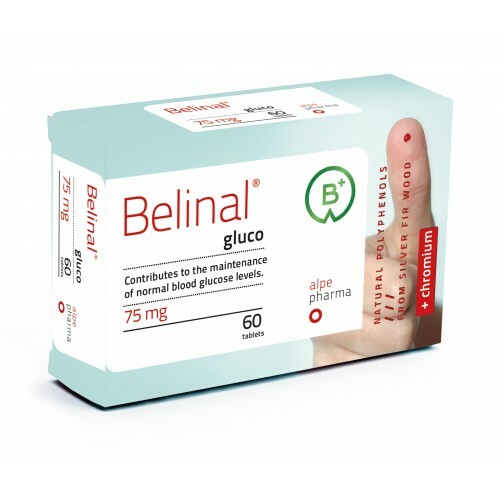 Belinal® gluco inhibits the breakdown of carbohydrates and, consequently, lowers peak blood glucose levels after meals, ant it also contributes to the proper functioning of insulin in the body. If the body lacks chromium, it needs more insulin for appropriate control of blood glucose levels. Insulin is a hormone which acting as a "key", which opens the cells and enables entry of glucose which is then converted into energy. In addition, chromium helps to reduce the level of harmful cholesterol and increase the level of beneficial cholesterol in blood, and because of this, reduces the risk for cardiovascular diseases. Due to the potent antioxidant activity, Belinal® gluco also protects cells from the damage caused by free-radicals, which are more rapidly produced in case of high blood sugar. Only 20% of people appear to have sufficient amount of chromium in the cells. If you have problems with blood sugar, it is very likely that your body stocks of chromium are depleted. Chromium is involved in the metabolism of macronutrients and contributes to the maintenance of normal blood glucose levels. Diabetes is a chronic metabolic disease with rapidly rising prevalence and represents a growing problem in the developed world. Globally, over the past 30 years the number of diabetics has doubled and is growing constantly. The consequences of the rapid pace of life are physical inactivity and consumption of high-calorie processed food, which in the long term leads to various metabolic disorders, and ultimately, to the metabolic syndrome, obesity and type II diabetes. Constantly present excess of glucose in the blood makes you feel continuously tired and exhausted, thirsty and vulnerable to infections. Excessive amounts of glucose in the bloodstream are converted into fat causing the weight gain and accumulation of fat especially in the abdominal area. Glucose is the simplest form of sugar and represents the main source of energy in our body. We need enough glucose in bloodstream to provide the energy for all our cells. While the glucose is crucial as an energy source, in excess it is toxic. Glucose in excess triggers inflammatory processes in the body and "burns down" our cells by promoting oxidative processes. It also causes damage to cells, organs, blood vessels and eyes by a process called glycation. Glycation is a process where macromolecules and cellular components are destroyed by covalent attachment of glucose units. Therefore, our body is trying to remove the excess glucose from the bloodstream as quickly as possible. Based on the consultation with your doctor or pharmacist the number of doses per day may be increased. Belinal® gluco is also recommended to healthy individuals to renew their stocks of chromium in cells, maintain normal blood glucose levels and thereby reduce the likelihood of developing type 2 diabetes. Belinal® gluco is not a substitute for diabetes treatment prescribed by your physician. Bulking agent: microcrystalline cellulose 186.7 mg, solubilizing agents: calcium phosphate monobasic 100.0 mg, pregelatinized starch 32 mg, Belinal® extract from silver fir (Abies alba Mill.) branches 75.0 mg, diluent and absorption enhancer: maltodextrin, anti-caking agent: silica 4.0 mg, lubricant: magnesium stearate 2 mg, chromium picolinate 0.26 mg.
sweeteners, lactose, yeast extract, gluten, artificial pigments, preservatives, and are suitable for vegetarians. Store in a dry place at temperature below 25 °C. Children under 3 years of age, pregnant women and nursing mothers must consult their doctor or pharmacist before taking the supplement. In case of taking other medicines contact us via email info@alpepharma.si and provide us the list of medicines you take together with dosing regimens. Dietary supplement is not a substitute for a balanced and varied diet and a healthy lifestyle. Recommended daily dose must not be exceeded. A healthy lifestyle is recommended for optimal effect. Belinal® gluco pill has to be consumed 15 minutes before a large meal. If you've forgotten to take the pill, you still can take it together with a meal. The best efficiency is achieved to take a pill before or during a meal because it contributes to the reduction of the glycemic index of your meal. The recommended dosage is 1 tablet 15 minutes before each major-large meal (breakfast, lunch, dinner) with a glass of water. Belinal® gluco is also designed for healthy persons after 30 years of age. We recommend two-months therapy, which will renew the stock of chromium in your body. One of the most important things for your health is to reduce the probability of the occurrence of diabetes. We also advise you to avoid sugary drinks and food and you should increase everyday physical activity. No. It can be interrupted only in case the treating physician evaluates your health has improved so much that medical tretment wouldn't be neccessary any more. Belinal® gluco is a nutritional supplement that can contribute to the maintenance of normal glucose levels in the blood and contributes to your well being. Yes. Belinal® gluco is a dietary supplement with no side effects so it can be consumed together with other drugs. In case you already have a prescription for taking any kind of drugs talk with your doctor or pharmacist. You may also contact us at info@alpepharma.si and we will answer you. Yes. Belinal® gluco is a safe dietary supplement. Numerous scientific analysis and research are carried out. Analysis of the quality of the ingredients in the products are approved from the Faculty of pharmacy - University of Ljubljana. No side effects has been noticed during the clinical trials on humans.